The annual College Art Association conference is sometimes compared to a “meat market” for young artists seeking teaching jobs. Lacy created an all-night performance broadcast live over closed-circuit television to every room in the Hilton Hotel in Los Angeles, where the conference was being held. Made up as an elderly woman, Lacy sat, stood to sort through various artifacts on a dresser, and periodically tended a bedridden body concealed by covers in one of the many rooms assigned to conference participants. A tape-recorded monologue by older women (Edna, May Victor, Mary and others Lacy had worked with on a prior performance, Inevitable Associations) periodically offered ruminations on aging, the body, and death. Occasionally the program was interrupted by an audio or textual command: “Talk if you must, but please stay tuned,” or “Sleep if you must, but please stay tuned.” The cameras stayed trained on her while the monologues continued. Later people staying at the hotel reported on the dream-invasion caused by leaving the televised performance on all night. In the early hours of the morning Lacy finally lifted the body, a lamb carcass, out of the bed, placed it on her chair, and climbed in bed in its place to sleep. 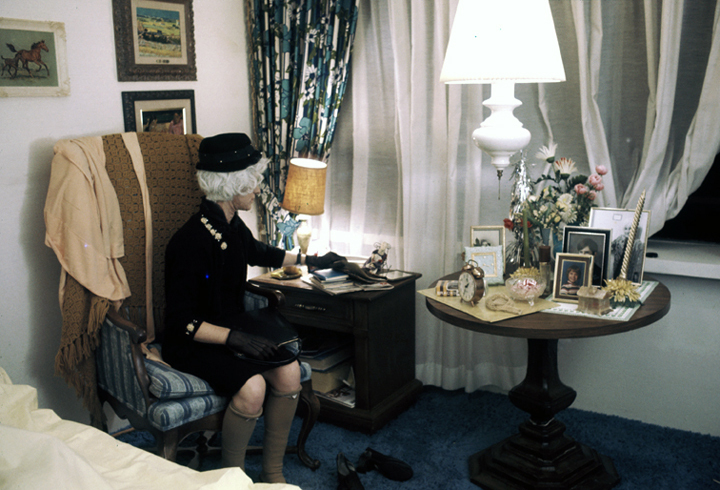 Later than morning, Lacy joined curator David Ross in another hotel room on his “CAA Talk Show,” featuring interviews with artists such as Linda Montano and Harry Kipper. After reporting on the prior night’s performance piece she presented “Lamb Chop,” a puppet with the head of the lamb carcass and a little furry body operated from behind the couch by Susan Mogul, who bleeted out the sad tale of young artists, and Lamb Chop, seeking teaching work at the CAA.